Is there a DA* 30mm/1.0 in the works? The reason I ask is that photo showing the top LCD of the K-7 with an aperture set at F:1.0. Now theres no way you can set an aperture larger than the largest available on the lens in use with the Pentax K-mount. Of course it could be photoshopped (but doesn't look like it) but why would anyone do that? Anyway, we know theres a 30mm on the way. Pentax have said that they will realese lenses from now on along with the cameras. Is the 30mm a standard lens for the K-7? Canon did make a 50/1.0 for the EOS system. This was possible because of the EF mount large diametre compared to other SLR mounts. It was a show off basically. However, the Pentax K-mount is also large compared to the APS-C sized sensor. A hypothetical 30/1.0 could have the same mission in the Pentax APS system as the Canon lens had for the EOS system, with the exception that a 30/1.0 will be far more affordable (but still expensive of course). This lens could sort of display the advantages and posibbilities of the APS system and make it seem even more viable compared to FF. In spite of all the DOF talk, most people use very fast lenses in order to shoot under circumstances not otherwise possible. Such a fast lens, in addition to better high-ISO performing sensors and even better Shake Reduction (up to 4 stops with luck), opens up completely new shooting opportunities. Pentax have already explored the compact prime APS advantage; how about the very fast lens advantage? I know the 30mm is removed from the roadmap but this could be to increase the shock effect from releasing such a lens. Also, having it on the roadmap may make some postpone buying the 31/1.8 or 35/2.8 to see what the new lens is all about, something pentax is probably not interested in. Note that this is pure speculation on my part and not based on rumors or inside information. My guess is that if that picture is real, it was in some sort of demo mode just to show the range the camera is capable of. Don't hold your breath. I think the display we saw with the 1/8000 and F1.0 just was a sort of 'test' image of the display, to show the highest possible shutter speed and the widest aperture the display can display (if you understand what I mean). As for the the DA 30, I would love to see a fast prime in this range, although I already have the Sigma 30mm 1,4. I doubt it would be faster than 1.4 or 1.2, but that's total specualtion as well. The camera can set f/1.0 aperture. Time will tell if there will be a lens for it. The user can set the aperture for the non-KA lenses, as we set the focal length for them when turn the Shake Reduction on. Maybe using manual lenses it shows "f/1.0" instead of "f--"
I doubt it will be a 1.0, but I hope they do release a 30mm f/1.4 along with the K7. This was discussed briefly in the "Whats with the FF postings thread". As I said there, Pentax may currently make a 31mm, 35mm, and a 40mm prime, but none of them are a true replacement for the fast 50's from back in the film days that so many photographers love. The 31mm Limited comes the closest, but $900 is way out of the range for what most people (myself included) will pay for f/1.8 glass. Pentax needs a 30mm 1.4 or faster ASAP. Also, hopefully it won't be ridiculously priced like the DA Star 55mm. I know it's a wonderful lens, but $700? Ouch. Nikons equally good new 50mm 1.4G is currently only $485; and was selling for $440 when first released. No, we won't be seeing something like that. 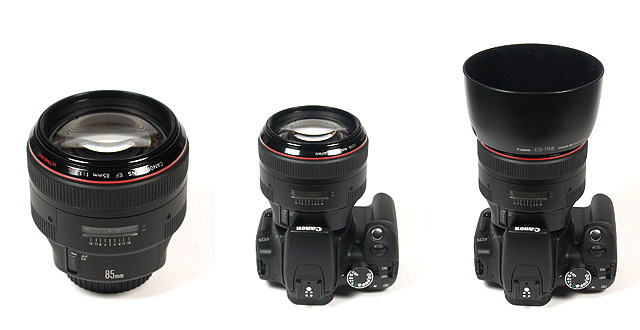 It will be much smaller than the Canon lens. Not much larger than the DA* 55/1.4. If Pentax is capable to produce the lens as Canon do with 50mm 1.0 L USM, how many people will buy it with the price tag ~ 2500$ ? I'm all for a DA*30mm to go along with the DA*55mm. I don't really care for a f1.0, and I'd be more than happy with f1.4. Pentax will have LBA run rampant for years to come! I think it is physically impossible to make a 30/1.0 lens for a PK mount camera, irregardless of how big you make the primary element. I think it's impossible to make a 50/1.0 lens for a PK mount camera. The register is too long (and the mount opening is too narrow). I believe the Canon mounts (EF for sure, I don't know about FD) are the only ones for SLR with a register short enough and mount opening wide enough to barely make a 50/1.0 possible. Obviously, shorter the focal length the harder it gets (because of the register), so a 30/1.0 is not possible even on EF, let alone PK. It won't cost that much. This is one of the advantages of APS-C format; lenses are cheaper to make as they don't need to cover as large image circle. It believe that Pentax should take all the advantages the smaller format gives. They have done that with the DA Limites which are ultra compact. All times are GMT -7. The time now is 04:21 PM. | See also: NikonForums.com, CanonForums.com part of our network of photo forums!